The main focus for most of the game. Lycia is home to several smaller territories, all who pledge allegiance to Ostia, the head of the League. Each of these territorities is ruled by a single Marquess, usually referred to as Marquess Ostia, etc. Ostia – The capital city, ruled by Uther. It is said the fortifications are so strong that none can invade it. Pherae – Land of knights, ruled by Elbert. It shares friendly ties with Ostia. Caelin – Ruled by Lundgren, brother of the Marquess. Lyn’s heritage has roots here. Note: Ciaran is the Japanese name. Laus – Ruled by Darin, a man who serves the Black Fang and aims to overthrow Ostia. Santaruz – Eliwood passes here when he goes in search of his father. Araphen – Lyn comes here to find help to reclaim Caelin. Kathelet – Lyn first meets Eliwood here during her journey to Caelin. Tania – In the Hasha no Tsurugimanga, Tiena comes from here. Thria – Appears in Sword of Seals. Worde – Appears in the Hasha no Tsurugi manga. Tuscana – Mentioned in-game by Eliwood. Ryerde – No mention in-game. Sacae – Vast grasslands, home to various nomad tribes such as the Kutolah, Lorca and Jute tribes. Early in the game, Lyn visits Bulgar, which is the capital city. Valor – A small island off the main coast of Lycia. Deep within lies a great secret of the dragons, never seen before for almost a thousand years. Nabata – A huge desert, where the utopian village of Arcadia lies. Eliwood and the others come here to find help from a “living legend”. Kingdom of Bern – A militant land, ruled by King Desmond. The Black Fang’s operations originate from here. Western Isles – Fibernia, Caledonia and Dia. These islands are mostly inhabited by unruly pirates. Hector briefly visits here when he tries to obtain Armads. 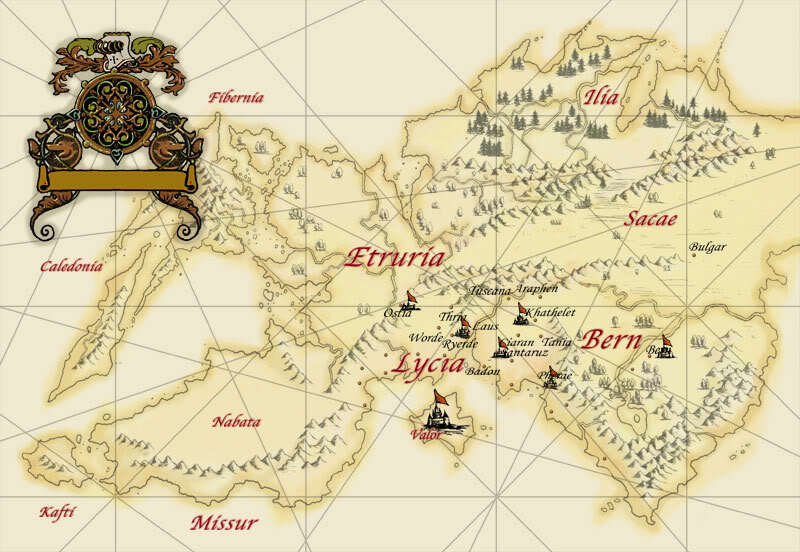 Kingdom of Etruria – A prosperous land, said to be equal in strength to Bern. The Mage General of Etruria, Pent, aids Eliwood later in the game. Ilia – A snowy and well-forested region. It is famous for its mercenary knights and female Pegasus riders.